Wouldn't you love it if your boss said you had to "Report To Disney World?" Well, the Atlanta Braves are doing just that as they report for Spring Training at ESPN's Wide World Of Sports Complex at the Walt Disney World Resort. 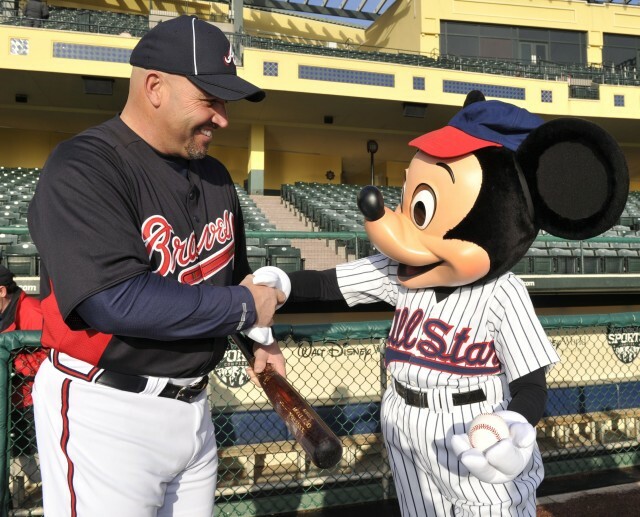 This marks the 15th consecutive year that the Braves have called Disney World their Spring home. In addition to their practices, they will have an 18 game home schedule against Major League Baseball's top teams that Disney World guests can see. Marquee opponents visiting Champion Stadium in March include the World Champion St. Louis Cardinals, New York Yankees, Philadelphia Phillies, New York Mets and Detroit Tigers. Guests also will be treated to game-day entertainment and additional fan experiences in a way only Disney can do, from character appearances, to an exclusive On-Field Spectator Experience and kids running the bases after the game. The schedule features three night games at Champion Stadium – the Washington Nationals on March 14 and the Houston Astros March 16 and 30. Information on the Braves’ spring training season, group tickets and mini-packs is available by calling 407/939-GAME (4263) and online at www.espnwwos.com/atlantabraves. Individual game tickets are available through Ticketmaster (800/745-3000 begin_of_the_skype_highlighting 800/745-3000 end_of_the_skype_highlighting and ticketmaster.com) and at the sports complex box office. 1 comments to "Atlanta Braves Are Reporting To Disney World (For Spring Training)"
How can I buy the spring training games video of the braves with astros on March 16th, please?